We are very excited to announce that our new clinic is finally fully operational and is open for business. The new clinic includes a fully equipped surgical suite and is the first veterinary facility on the Gold Coast built specifically for horses. Did you know that a well planned and regular vaccination program is one of the most effective ways of keeping your horse free from infective diseases. Call us to discuss your horse's vaccination needs. 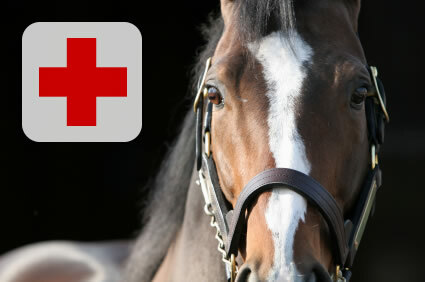 Did you know that you can get health insurance for your horse? Insurance can cover death, loss of use and most veterinary costs and is cheaper than you would think. Call us to discuss insurance for your horse today. Gold Coast Equine Clinic employs an experienced team of equine-only veterinarians who are dedicated to the care of your horse. We have two locations at Bundall and Nerang. Our main clinic is a purpose-built veterinary centre created specifically for horses, located at 15 Ken Russell Court, Bundall, within the Gold Coast Equine Precinct adjacent to the Gold Coast Turf Club and the Magic Millions Sales Complex. Our Nerang practice is located in the hinterland at 177 Latimers Crossing Road, Advancetown. From these two locations our equine veterinarians provide veterinary services to horses in the region stretching from Brisbane in the north, west to Beaudesert and south across the border into northern New South Wales. We are committed to providing the best possible care for your horse with our experienced and well-trained staff and through our state-of-the-art diagnostic equipment and treatment methods. We provide veterinary care to all types of pleasure and performance horses with an emphasis on the equine athlete. Our clinic is equipped with full surgical and diagnostic facilities which enables or vets to diagnose and treat horses on-site, or at your stables, in an efficient and professional manner, utilising modern and practical facilities and state of the art equipment. We pride ourselves in providing a highly efficient and professional service to our growing number of clients. We are committed to providing the best possible care for your horse with our experienced and well-trained staff and through our state-of-the-art diagnostic equipment and treatment methods. We service all manner of racing, pleasure and performance horses from cross-country, campdrafting, showjumping to dressage, pony club and polocrosse. Our vets are ready to help you ensure that your horse is maintained in the best possible health. We offer full surgical, medical and diagnostic services including a fully equipped surgical suite and recovery facilities, digital radiography (X-ray), digital ultrasound, shockwave therapy, pre-purchase inspections, endoscopy, IRAP joint therapy, on-site laboratory services, lameness examinations and evaluation, and routine spelling farm and racing stable visits. For more information on these services please click on the links below or phone us to discuss your veterinary needs.